I have a site with a sign in area. 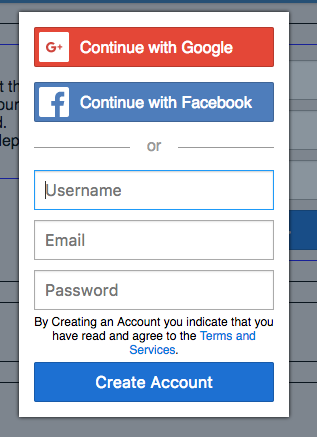 Should the regular Sign in/Create account buttons come before SNS Sign in/Create account or after? Like this, or vice versa? Arguably this comes down to whether you want people to sign up with your app specifically, or whether you'd prefer to drive them via a single sign-on provider. If you want to get people into the app with something they already (likely) have, then put the SNS buttons first. If you would rather encourage them to sign up specifically to your app, then give them that option first. Some people will always look for the single sign-on buttons as it saves them time, others like the idea of every account being separate, so will likely create a new account. Position the options in the order you would prefer your users to use. This is a typical question which depends on your visitor type. If you do not have a preference for a type of registration your visitors should choose I would simply test this with an A/B test. Then you quickly know which option works best for your specific user group and which option results in more accounts. Show the current votes before or after voting? If a checkout fails, should I still create a user's account?